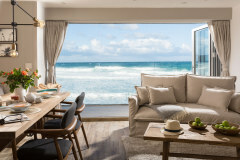 With breathtaking coastal views across St Ives Bay, Talland View has been wonderfully created for your very stylish coastal holiday. 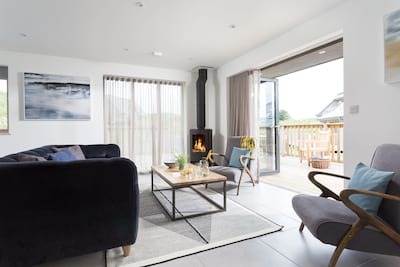 From the luxury linens and unique interior style to the spacious open plan layout and relaxed ambiance, this smart apartment sets the scene for your time out in West Cornwall. 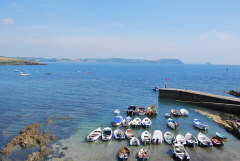 Talland View offers 2 beautiful bedrooms and 2 bathrooms, off road parking is available. Talland View is located on the first floor and accessed by one internal flight of stairs, arrive to the light and spacious luxury of this very unique apartment. 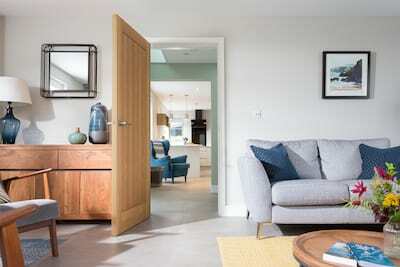 A central hallway leads through to the heart of the property, an open plan living, kitchen and dining space set against the ever changing backdrop of St Ives Bay. The modern galley style kitchen has been thoughtfully kitted out for your holiday cooking, the local delis and freshest of seafood offer great inspiration to your Cornish menu! The country style dining table is set by the balcony doors for a quiet afternoon tea in the winter or balmy summer supper with al fresco twist. 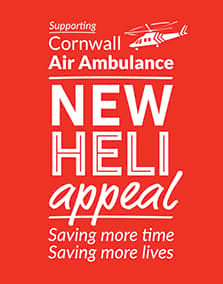 Relax in the living space at the end of a day in West Cornwall or enjoy a lazy sunny morning with a good book. The bedrooms are located to the rear of the apartment, choose from the master bedroom with double bed and ensuite shower room or a spacious twin bedded room. The family bathroom completes the luxury ambiance with stylish fixtures and fittings. From the moment you arrive Talland View oozes a unique style; much of the artwork, artefacts and beautiful books evoke the owners travels and combine perfectly with the more local influences of coastal Cornwall. 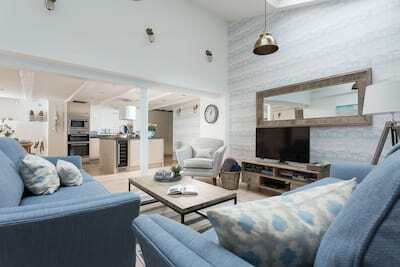 The apartment lies in an elevated position overlooking St Ives, from the open plan living space throw open the patio doors and enjoy the views stretching from St Ives Harbour and up the coast towards Godrevy Lighthouse. The balcony offers a dining table and chairs. Within the grounds, and accessed via the ground floor, is a communal established garden with lush green lawn. 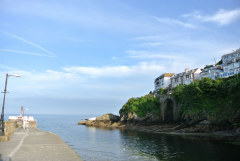 The cosmopolitan town of St Ives is within easy access (approx 10 minute walk) and offers a plethora of tempting places to eat, boutique gift shops, cool cafes and inspiring galleries. 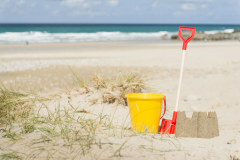 If a day on the beach is on the cards then choose from the white sands of Porthminster Beach, the harbour life of the central town beach or hit the surf at Porthmeor Beach. 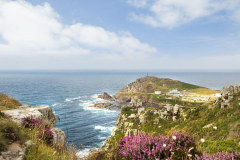 Pack up the car and head off for a day trip, the South of Cornwall offers a change in landscape as you discover quintessential quiet coves and fishing villages or head further West to the myth and legend of Land's End. 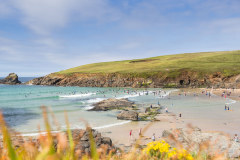 Action adventure enthusiasts wiill enjoy the luxury of the location with Cornwall's natural playground from your holiday door. Talland View is perfect year round from stormwatching weekends out of season to lazy summer weeks by-the-sea. A modern fully fitted kitchen with stylish granite work tops, extremely well kitted out for all your holiday cooking! We had a wonderful stay at Talland View. It was spotlessly clean and there was everything we could have possibly needed for a perfect self-catering holiday. The view was fab and the position was excellent - just far enough out of town, in a quiet peaceful spot. Can't wait to book again! Wonderful spacious apartment, comfortable, charming design, calm and relaxing. Excellent location, the view, parking. Look forward to booking again. The balcony and view was amazing! Loved the property. Excellent furnishings and wonderful views. 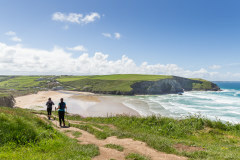 Another excellent holiday with Cornish Gems at Talland View. The welcome pack was excellent and the Christmas tree and lights were a lovely festive touch. 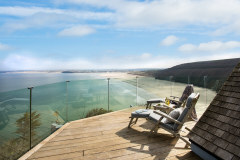 Beautiful apartment, fantastic views and very helpful people at Cornish Gems - definitely book again! The apartment was lovely - really tastefully furnished and decorated, and well equipped - a delight to stay in. The view was great too! A thoroughly enjoyable half term break, our first visit to St Ives and we loved. Apartment was excellent and walking distance to everywhere.